Crystal Jade Singapore is celebrating its 25th year this 2016. Since I used to live in the Philippines, I've come to know about the brand barely 6 years ago. However, I will never forget how I immediately fell in love with their signature Dan Dan La Mian and that's really a big surprise given that I used to have extremely low tolerance for spicy food. To this date, Crystal Jade will always be my go-to place whenever I'm craving for that mouthwatering spicy and peanut-y noodle soup. In a week's time, most parts of Asia will be welcoming the Year of the Red Monkey and we're already feeling the festive season here in Singapore. There are a few things I love about celebrating Chinese New Year here -- tossing our luck in the air with the traditional lo hei, enjoying all of the best ingredients in a pen cai, receiving some hongbao (red envelopes with money) and lastly, having an abundant supply of mandarin oranges. Back in Manila, we would also eat all the tikoy (nian gao) slices that tummies can handle which is soooo yummy! Anyway, I was invited to try the special Chinese New Year set menu at Crystal Jade Palace in Ngee Ann City a few weeks back. This is one of the fine-dining restaurants of the Crystal Jade chain. The others being the newly-opened Crystal Jade Prestige in MBFC, Crystal Jade Dining In in Vivo City and Crystal Jade Golden Palace in Paragon Mall. In addition to this, there's Crystal Jade La Mian Xiao Long Bao which specializes in (what else?!) 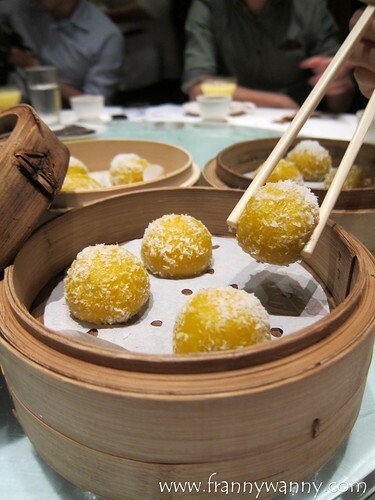 noodles and xiao long bao as well as a variety of Hong Kong-style dimsum too. Lastly, there's Crystal Jade Kitchen where you can enjoy short orders and indulge in their Steamboat Buffet which I love. Our preview dinner showcased a variety of dishes that will be served in the different Crystal Jade concepts. 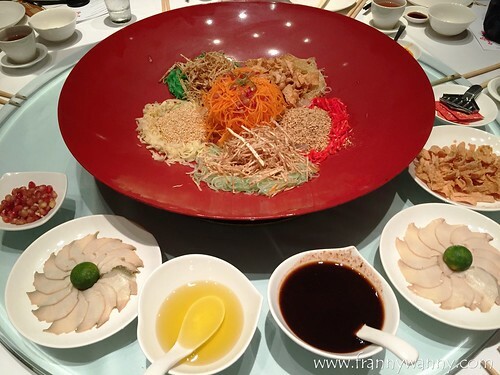 As soon as we're all complete, our server started filling up our table with all the ingredients that will go into the Prosperity Yusheng with Abalone & Pomegranate (S$88 / S$138). This is available in Crystal Jade Palace / Prestige / Dining In / Golden Palace. I was pretty excited to try this as I've never had yu sheng minus the yu (fish) and with abalone and pomegranate instead. I'm expecting this to have a sweet note due to the plum and pomegranate sauce. As soon as I had my first plate, I was right! I love biting into the small pomegranate pulp and the abalone gave the salad a more meaty feel. It was really good and I highly recommend it. 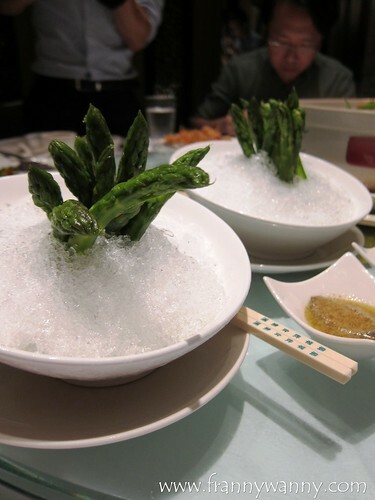 Next, we had the Chilled Asparagus (S$20) which will be served again in all of Crystal Jade's fine dining concepts. First thing that I'm going to tell you is, this is not your average chilled veggies. In fact, these sweet asparagus were flown in from the US and it's served with a yummy sesame truffle sauce. Really interesting and I'd say, a good palate "intermission" before our next dish. Following the very refreshing and light Chilled Asparagus, we had the Luxurious Abalone Treasure Pot or in other words, Abalone Pen Cai (S$318 for 6 pax / S$498 for 10 pax). Abalone, as you know, symbolizes good fortune and this is why people love having this during Chinese New Year. I love pen cai and no matter how often I have this, I really don't get tired of it. 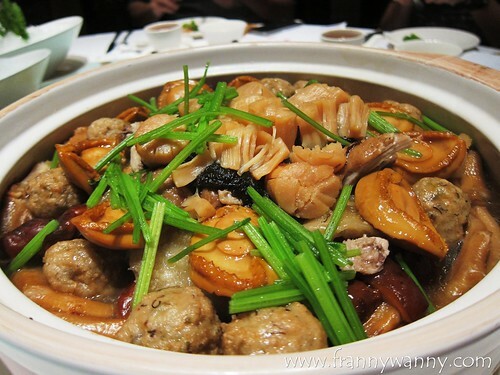 I find great excitement in digging into the huge pot and seeing what kind of meat, seafood or veggies is included in it. My favourites in this particular pen cai are scallops, abalone, roast duck, goose web, black moss and the veggies too. It was really abundant and is good for group sharing. At this point, we were all ready to raise our red napkins up in the air to surrender. However, we still have a lot more dishes to go! 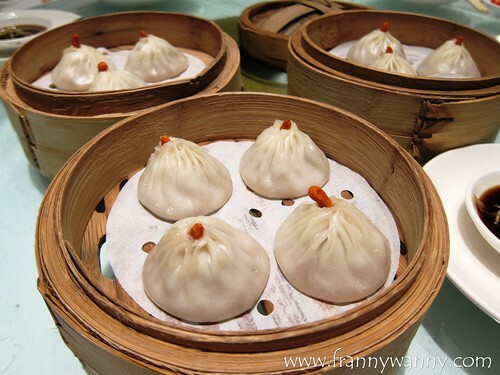 Aside from noodles and roast dishes, Crystal Jade is known for its superb xiao long bao. For Chinese New Year, they've created the Steamed Herbal Xiao Long Bao (S$6/4pcs) which will be available in Crystal Jade La Mian Xiao Long Bao (LMXLB). Admittedly, I found the soup a bit too bitter for my liking while my other dining companions loved it. To each his own, I guess. The Thai-style Pork Knuckle (S$28) reminds me so much of the very Pinoy Crispy Pata. 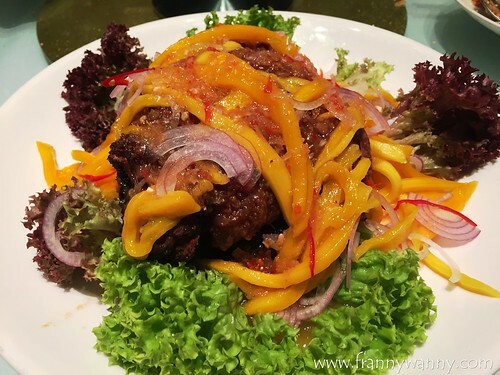 Deep-fried pork knuckle served in a sweet and sour sauce and topped with strips of mangoes. The meat was very tender and I love how the mangoes gave it a nice tangy bite. 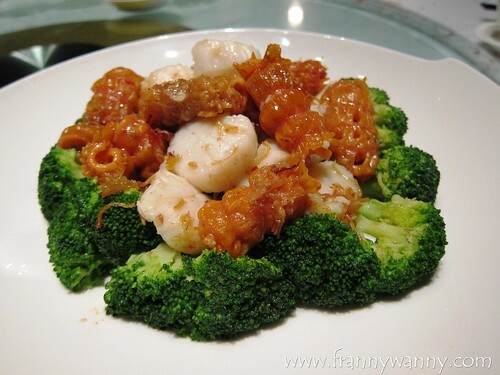 To balance out our very meat-loaded meal, we had the Sauteed Scallop & Coral Mussel with XO Sauce (S$28). Similar to the Pork Knuckle, both will be available at Crystal Jade Kitchen. I wasn't really expecting to love this as I thought it's a regular stir-fried dish with seafood and veggies. Well, I must say that this was my favourite aside from the yu sheng and pen cai. I love the crunchiness of the coral mussels and well, scallops and XO sauce just goes perfectly well together. I would love to have more of this with a bowl of white rice on my next visit. Oh, I can feel my mouth watering already. For dessert, we had the Steamed Pumpkin Glutinous Rice Ball with Bean Paste (S$4.80 / 3 pieces) which will be served at Crystal Jade LMXLB. I love this! It's a yummy sweet ending to our delicious meal. 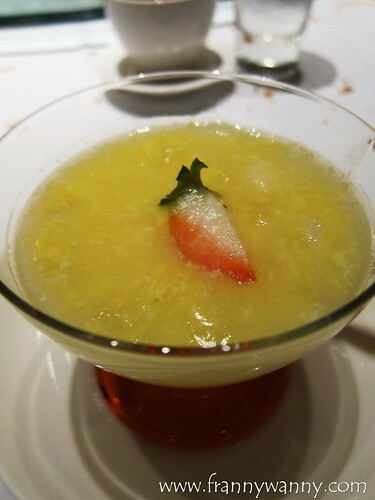 We also had the Double-boiled Water Chestnut with Egg White from Crystal Jade Prestige. I have to say that when I first read the menu line-up, I thought that this would be our soup. However, it was served at the very end on a nice cocktail glass with a piece of cut-up strawberry sitting on top. Plus, it was served cold. Hang on a minute, so this is actually a dessert? Except for meringues and Mommy's Angel Cake, I don't think I've ever had anything with egg white for dessert. Well, as my Mom would always say -- "you'll never know unless you try". So, I did and I loved it! The water chestnut gave it a nice crunchy bite which reminds me of my favorite Thai desserts. It has a nice comforting touch to it which is really how desserts should be. It was definitely a delicious and prosperous pre-CNY dinner at Crystal Jade. I love how each restaurant concept has prepared several set menus for their patrons to choose from. It's really a matter of finding the right one that suits your specifications be it a classy formal reunion dinner or a casual family get-together. In addition to these dishes, I highly recommend for you to check out some of their Chinese New Year snacks too. Paul and I love the Almond Puff Cookies (S$12.80) which has a nice buttery and nutty texture in every bite. Another great discovery was the Fortune Bo Lo Pineapple Tarts (S$10.80 - S$20.80) that looks like mini bo lo buns but filled with sweet pineapple jam. It comes in small bite-size pieces that is so addicting. You might have to fight the urge to just keep popping one piece after the other into your mouth. In fact, I just bought a couple of boxes to bring home to Manila with me. I'm pretty sure our families will love this! Ordering was a breeze too. All I had to do was to log on to their e-store, select the items that I want, choose when my pick-up date and venue will be and make my payment. Done! Visit Crystal Jade Singapore's official website to get the list of branches all over the world. Don't forget to like them on Facebook and follow them on Instagram too!